SALISBURY, Md. – The No. 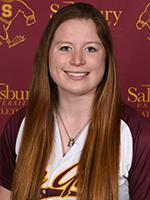 25 Salisbury University softball team got back in the win column on Saturday afternoon. After dropping the opener of the team's doubleheader against Ursinus College at Sea Gull Softball Stadium, the Sea Gulls rallied for a 7-6 victory in the nightcap. The Bears struck first in the opening game, getting a pair of two-out walks before dropping a single just in fair territory down the right field line for a 1-0 lead in the first inning. The lead lasted only until the home half of the inning. A long at-bat for leadoff hitter Dakotah Fraley ended with her drilling her third home run of the year to left field, tying the game at 1-1. Salisbury took the lead for the first time in the second, loading the bases with two outs and Emily Allen lined a single to left field, bringing home Cat Ramagnano for the 2-1 advantage. A solo home run by Heather Lazer in the top of the third tied the game at 2-2 and Ursinus took advantage of a pair of Salisbury errors to retake the lead, 3-2. Another run in the fourth made it 4-2 in the Bears' favor, but Salisbury would answer. In the bottom of the fourth the Sea Gulls brought home three runs. Allen started it by ripping a double that just landed in fair territory down the left field line before Kaleigh Edwards' sacrifice fly tied the game, scoring Madeira Alexander, and a single by Amelia Trotter brought home the go-ahead run. The Bears, however, would answer with a pair of runs in the top of the fifth to secure the win. The Sea Gulls started strong in game two, using a walk and an opposite-field home run by Allen – her third of the year – to take a 2-0 lead in the first inning. The Bears made a quick pitching change, but ended up with the same result. Edwards, Salisbury's next batter, worked the count to 3-and-0 before drilling the next pitch for a solo home run and a 3-0 lead. The Bears (5-7) put up two runs in each of the third and fourth innings against Salisbury starting pitcher Alexis Layton (Delmar) to take a 4-3 lead. Salisbury (10-7) took control in the late innings, scoring twice in the fifth and adding a key insurance run in the sixth. In the fifth, a hit batter and a single put two runners on for Kira Konarski with two outs. The freshman came through, sending a line drive to left-center field, which scored the two runners for a 6-4 lead. An Ursinus error in the sixth allowed Fraley to score Salisbury's final run as Layton kept Salisbury in the lead. The junior worked into the top of the seventh inning, giving up just three earned runs and striking out three in the game to pick up the win, her fourth of the year. Senior Shannon Powell came on in the seventh and recorded the final two outs to earn her second save of the year. The Sea Gulls will be back in action on Tuesday, March 26 traveling to Wesley College for a doubleheader, which is slated to begin at 2:30 p.m.